In worship, music is both an experience of God’s presence and an expression of faith and praise. Music allows us to address and express much about our faith which lies beyond the spoken word. Music at Concord is grounded in the traditional, but includes hymns and anthems from a wide spectrum of musical genres, including classical, contemporary, gospel, spirituals, and global song. The music staff are classically trained professionals who lead us to honor our faith, worship experience, and gifts by striving for excellence in all aspects of our music program. Our outstanding 30 – member Chancel Choir sings special music and leads congregational song each Sunday. 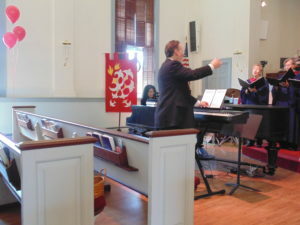 Several times a year, instrumentalists – both church members and guests artists – share their gifts, whether guitars and percussion for Gospel Sunday, strings for Christmas, brass and timpani for Easter, or budding young musicians on an ordinary Sunday. Additionally, the Concord Concert Series is our music outreach ministry that combines the finest professional musicians with dedicated volunteers to present high-caliber concerts, recitals and staged productions throughout the year.